A fine mid-January day in southern Arizona, Painted Rock Petroglyphs, inside the Bureau of Land Management, finds me in conversation with our recently arrived friend Circ, who with his wife Cindy have parked next to us in their brand-new custom-built fifth-wheel. As I stretch out my arm to point out a distant object, we both stop silent as a loud buzzing noise reveals a boisterous ruby-throated hummingbird parking itself momentarily in front of my face, then moving in lightning bursts around my Ruth-made tropically colored bespoke Hawaiian shirt. Having announced its birdish intentions, it darted off to a distant creosote bush, returning shortly to carefully inspect the red taillights of our truck. Later that afternoon, Ruth and I relaxed in our Airstream panorama windows taking in the distant prospect of Oatman Mountain that we had hiked last year, and were startled by a hovering stationary intruder on the other side of the glass, inches from our faces. If there is such a thing as mind transference, or at least inferred or imagined on our part, it seemed apparent to us that we were being instructed to procure, as quick as a hummingbird progresses, a source of sustenance. Winter rains and moisture persist in the desert for such a paltry amount of time, and flowery nectar would soon be scarce: time was of the essence. The distance to the closest decent store offering feeders and nectar makings was nearly one hour away. We needed to couple that with several shopping and fueling tasks to justify the impending mission, and the next day we set off in the morning to respond to the transmitted avian supplications. 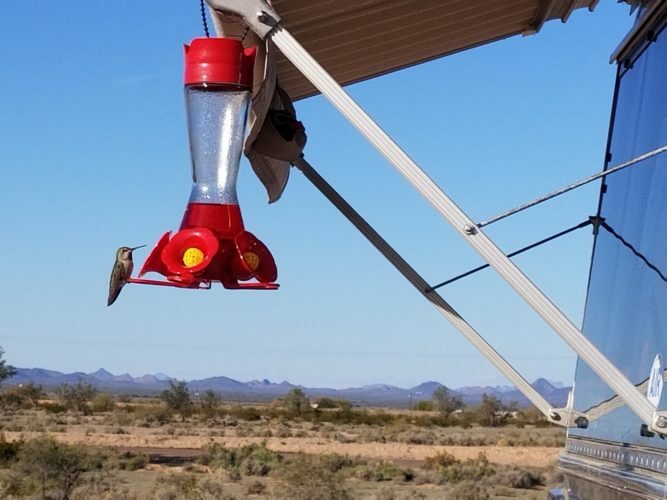 Upon arriving back from our trek, we no sooner prepped the feeder—loading it with ruby red sweetness—than, as it was being lifted in place outside our window, hummingbirds announced their presence, hovering around us and challenging each other for places in the café queue. Our feeding oasis, brilliant in the southern exposure, swings a nonstop to-and-fro from the constant visits of our new, tiny, ravenous guests, and from time to time, one will pause in front of the window, glance at each of us in turn, and buzz and chirp what seems a satisfied acknowledgment. Sunset in the West. Our fading day star absorbed the crimson flush that illuminated our hummingbird feeder throughout the day, and splashed it across the fading light of the sky in a massive explosion. The atmosphere around us took on the hue of a rich cabernet, and distant mountains in the east darkened in lilac, lavender, and amethyst luminosity. We settled around our propane firepit to warm ourselves against the creeping coolness of the evening. Far off in the distance, a voice cried, Hohoohoo, hoo, hoo…—the call of the Great Horned Owl, the denizen of the dark—seeking companionship? I returned the call in a higher pitch but matching the cadence. The invisible owl returned my call. It sounded like it had moved slightly clockwise. The owl’s ongoing calls, and my ongoing responses, echoed out across the silent campground. Ever so slightly, the owl’s call moved closer to our camp, edging around us until it emanated from the opposite side of our Airstream from our flickering fire. The call—Hoohoohoo, hoo, hoo…—now seemed just feet away. Ruth and I looked at each other with eyes as big as our new winged companion’s and slowly rose up out of our chairs to creep around to the back of our rig. 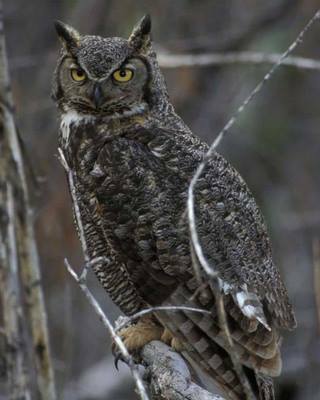 There before us, perched on a small boulder just 20 feet away, a Great Horned Owl swiveled its head and large tufted ears seeking out the source of the conversation. Its eyesight being much more perceptive, it spied our heads peeking round and, after a longish, puzzled pause, it stretched out its massive wings to fly silently away and renew its search for the mysterious mate. Perhaps in the ensuing nights, we may capture our owl in the camera’s viewfinder: by being a mock bird-of-a-feather, we may yet flock together.